Smoking tilapia on a cedar plank is a great way to impart a smoky flavor into the light and healthy fish fillet. The cedar plank is a great base for allowing your fillets to cook and not fall through the grill grates as they become flaky toward the end of the smoking process. This recipe is best when paired with a light fruit smoking wood chips like apple wood. Smoking fish is easy because it is quicker than any other type of meat. This cedar plank smoked tilapia recipe can be cooked in about an hour to an hour and a half. Start this recipe by rubbing in the garlic and herb and lemon pepper seasoning on both sides of the fillets. Then sprinkle on the lemon juice and oil on the top of each fish fillet. Soak your wood chips and the cedar planks in water for approximately an hour before you want to put your tilapia on the smoker. This will help keep your wood lasting longer instead of quickly burning. Light your charcoal smoker approximately 30 to 35 minutes before you want to put your cedar plank tilapia on. Your charcoal will be ready when it turns to a glowing white ashy color. Place your seasoned fillets directly on the cedar planks and then place them on your smoker. Check the tilapia after an hour to check for doneness. It may take up to an hour and a half to finish smoking. See below for more information about smoker cooking times and how to determine when your fish is done. 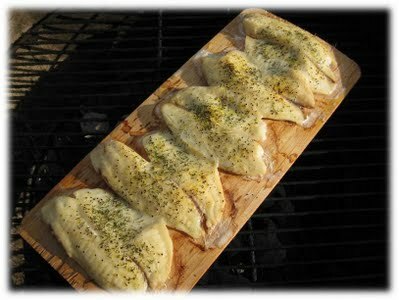 The cooking time will take approximately 1 to 1 1/2 hours to smoke the tilapia on the cedar plank. Simply check the fillet for turning a white opaque color with a flaky texture in order to determine if it is done. Generally with fish, you can simply stick a fork in the center of the fillet and see if it is warm to check for doneness.